Our first day in Maui did not go exactly as planned. Afte r the drive the night before from the airport to our condo near Kaanapali, we decided we didn't like the rental car we had. It was more like a boat than a car and the passenger seat was very uncomfortable. 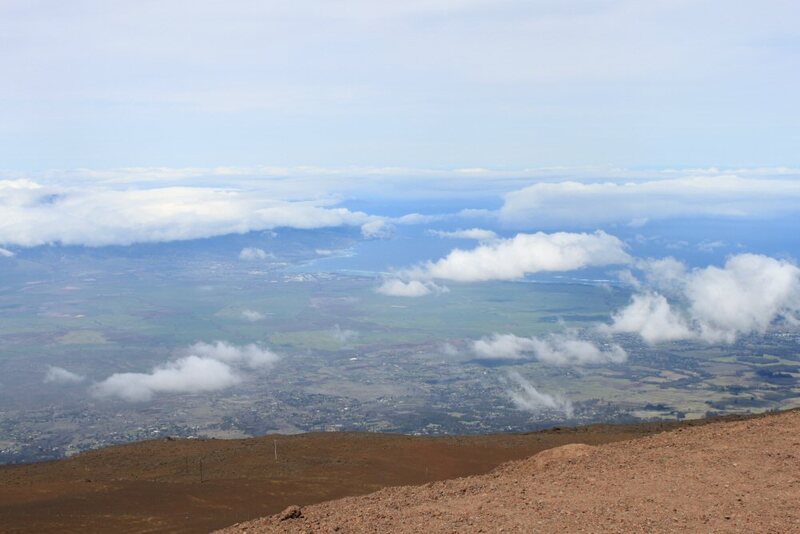 So we opted to drive all the way back and exchange the car for something smaller and while on that side of the island make an exploratory trip up to the summit of Haleakala. 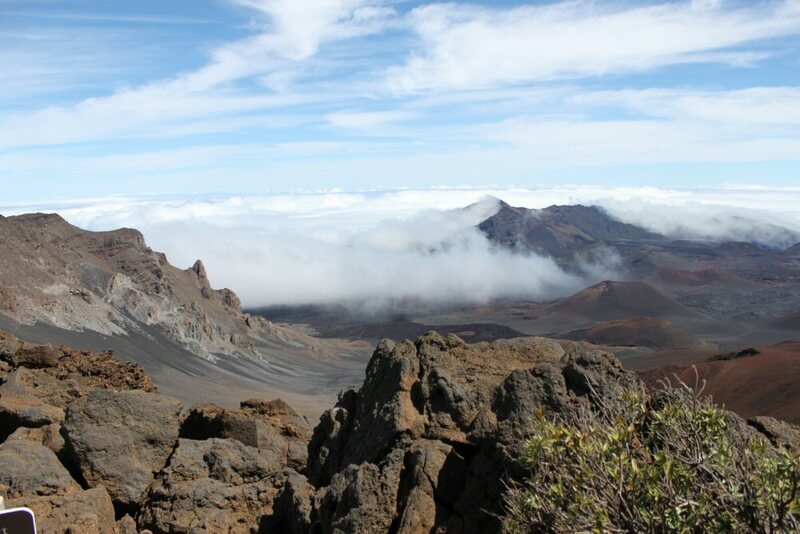 Haleakala is the large dormant volcano on Maui. We have been to the top several times so we were smart enough to take along jackets. The last time we had visited in February, there had been a light snowfall. The temperatures at the summit are about twenty degrees cooler than near sea level. A stop at Sunrise Market, a little snack shack part way up and the last chance to grab something to eat for lunch, netted us a turkey sandwich and some chips and water. Sustenance enough. We continued on, ears popping along the way. The road began to get a little hairy--that's probably why they call the sharp bends "hairpin curves." Big white clouds partially obscured the view of the isthmus below us. 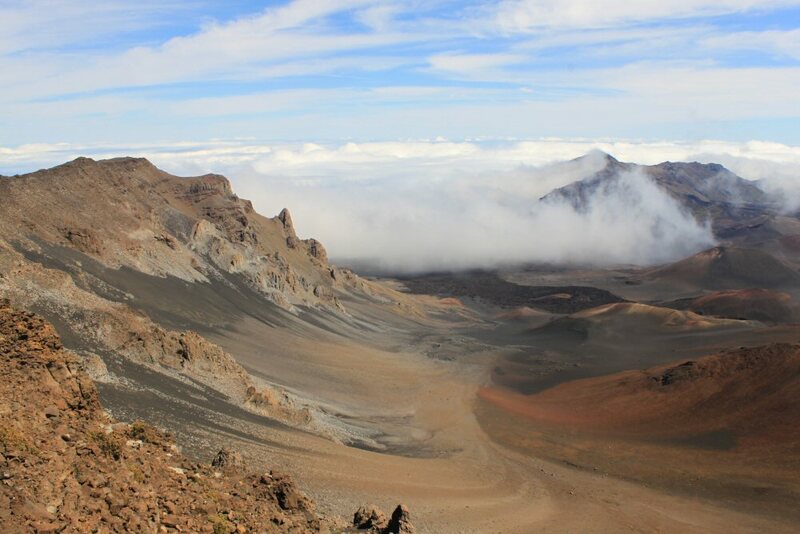 Maui has Haleakala on one end and a mountainous region on the other with a narrow strip of fertile green land connecting the two. A lot of the green is from sugar cane which is still being grown there. There is always a point where you go through at least one cloud and get misted or rained on. This time it was hanging over the first visitor's center where we stopped just inside the park. By the way, the fee for a passenger car is ten dollars and is good for three days. The center has books and information about the park and a model of the NeNe, the official Hawaiian bird. We have only seen it once and then briefly as it darted across the road. 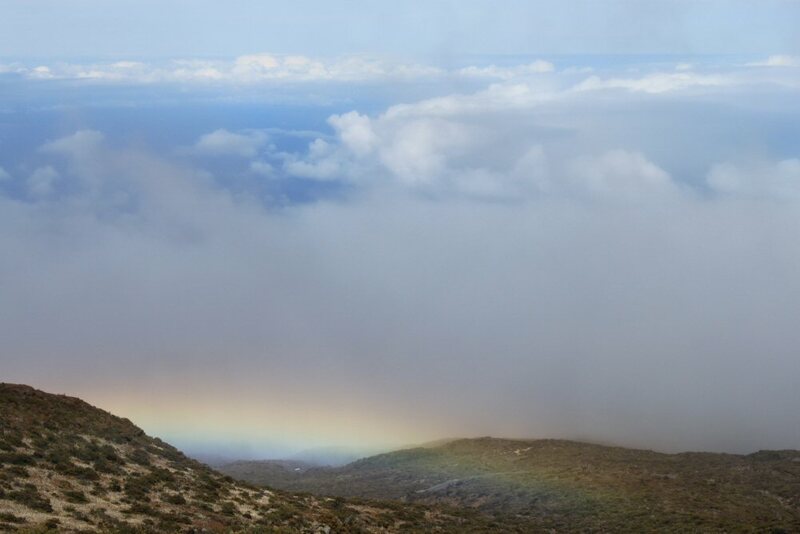 Further up, we stopped a moment for a picture of the misty cloud we had passed through. The sun was making it glow like a rainbow. Near the summit is another visitor center where you can see into the crater or caldera or erosional depression as they now call it. The colors are spectacular from all the different minerals in the rocks. The wind, however, was strong enough to make you sway. Luckily there is a nice view from inside the center where you are sheltered from the wind. We continued up a short way to the actual summit--elevation, 10,023 feet. 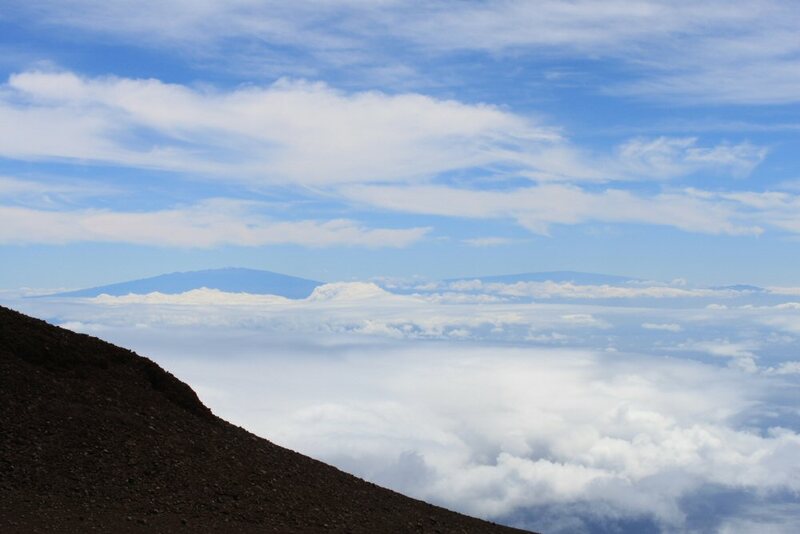 From there you could see the tops of the volcanoes on the big island of Hawaii as well as a great view of Maui which came and went as the clouds moved through. The skies become like works of art here at times, changing patterns and colors constantly. Our drive down--in low gear to save the brakes, was just as exciting. Thankfully th ey don't allow groups of bikers to scream down the road from the top like they used to. There are individuals who do so you still have to be careful. 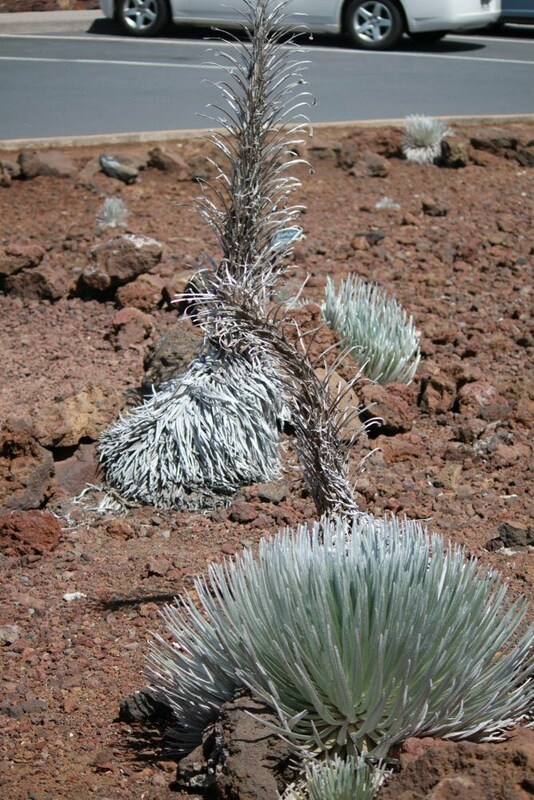 We stopped at several lookouts on the way down, took pictures of the unusual Silversword plants and pulled off into the Hosmer Grove to have our lunch. It's a small campground with picnic tables. 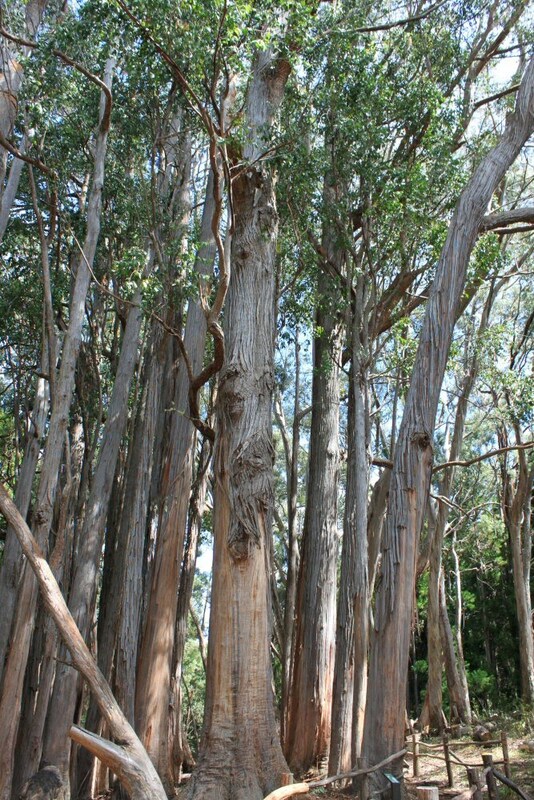 There are a couple of trails that t ake you through the forested areas that were planted by Ralph Hosmer near the beginning of the 20th century as a means of discovering if there was a viable timber industry for Maui. Lots of pines and eucalyptus create a beautiful wooded area. The trails also lead through more natural areas of native growth and are home to some very colorful Hawaiian birds. Our lunch and hike done, we finished the rest of the trip down. All the while, I could only imagine what it was going to be like going back up--in the dark--at 5 in the morning. We're studying Hawaii next month for our state study. If you see a state map or travel brochures, it would be great it you could pick them up for us!